So I'm in a bit of a funny place with R&B right now, especially the stuff that's more mainstream-accessible - namely that I get the impression that the more sensual tones are due for a subtle shakeup, both in tone and the artists involved. And while I'll wholeheartedly admit a big part of this is me waiting for the inevitable Jhene Aiko breakup album that tears into Big Sean, part of it is linked to how pleasantly surprised I was with Mariah Carey's last album and how indifferent I've been feeling with Ariana Grande recently - mostly because I'm surprised at the relative lack of competition! Hell, last year we got some spicy takes surrounding who the 'king of R&B' is prompted by Jacquees of all people, why does it seem like the modern era of queens are ceding the crown to Ariana so quickly? And while I could make a bunch of excuses - SZA is between albums, Ella Mai is just starting out and doesn't quite have the pipes, H.E.R., Alina Baraz and Kali Uchis are still underground, Teyana Taylor got screwed by Kanye, Janelle Monae is too weird and amazing to even be a part of the conversation, and I don't even want to get into Tinashe right now - the truth is that a lot of major labels are losing money by not capitalizing on that lack of competition. So I'm stuck going into the underground to find those artists with the chops to compete - and early in 2019, I actually found one. Meet Asiahn, a singer-songwriter who also goes by Asia Bryant who you might recognize if you dig through the liner notes behind some pretty sizable acts, but she started coming into her own with the release of the Love Train EP back in early 2017. And going back to it now, I'll admit I'm a little surprised she didn't get more traction - thanks to her work behind the scenes she's racked up a few Grammy nominations, but more than that, her debut EP is actually really good! I'd struggle to call it precisely great - a stunningly subtle voice and solid lyricism can only get you so far if your production and hooks aren't the sharpest - but she had a lot of taste and potential and I had hope for this full-length follow-up, so what did we get out of Love Train 2? Honestly, we got a pretty damn solid album - I wouldn't call it a great one as of yet, but it's the sort of find that deserves to get Asiahn a lot more attention as a songwriter and performer who can present a compelling narrative over the course of a full project. 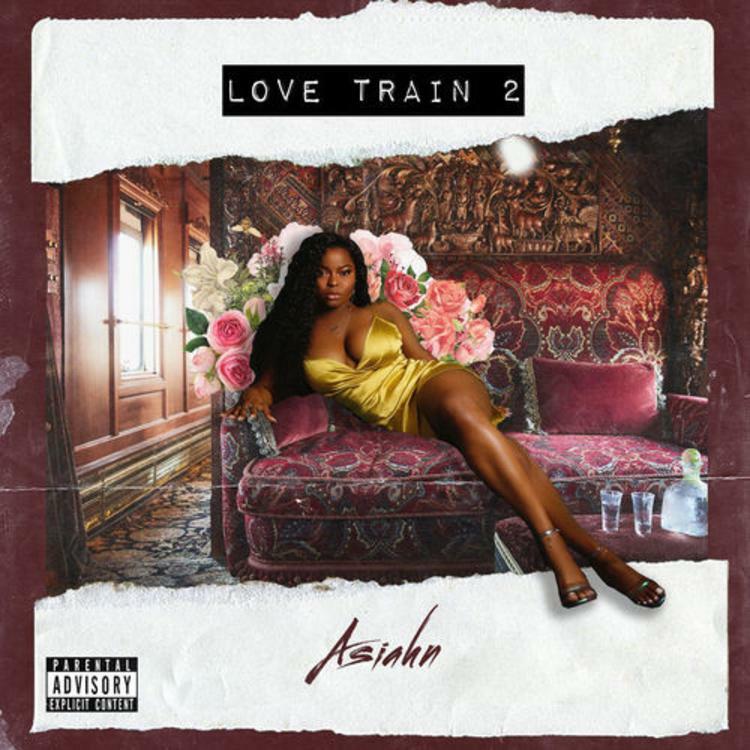 And while I will make comparisons to a certain other R&B artist with a similar style and timbre to whom Asiahn is shy of approaching, I'd argue Love Train 2 definitely deserves to place her in the larger conversation. So let's get the comparison out of the way first: from her vocal timbre to her method of multi-tracking, from the midtempo, atmospheric production to the narrative-driven concept that carries the album, the comparison to Jhene Aiko is impossible to avoid, and I'd be lying if I said that in terms of lyrical nuance and detail, construction of hooks, or even command of her delivery, Asiahn is not yet on her level. But at the same time, I'm not about to complain about a singer who has the sort of timbre and control as someone like Jhene Aiko, and Asiahn might even be more willing to embrace the pure sensuality in her delivery, like on the spoken-rap third verse on 'Drip'. Hell, her more direct language probably makes her more accessible, or at least shows a singer who's willing to confidently take a more explicit lane with this delivery, and even though this is not a project that is made for me, I can certainly hear the appeal! And I might as well talk about that now, which takes us to the larger narrative of the album: a pretty standard break-up-new-love arc, with the angle being that Asiahn is a lesbian and that does change the language and emotional approach. Now this is not an unheard-of angle in pop or R&B - off the top of my head Hayley Kiyoko approached similar subject matter on Expectations just last year - but there are subtle differences that place Asiahn in her own lane. For one, she's not one to quickly compromise her integrity and thus while she's tempted on songs such as 'Like You', she's not one to cheat, choosing to end things definitively and for good reason on 'Truth, Vol 2' with the acknowledgement that she's comfortable being on her own, especially if she has to work on herself. And while we do have those moments where guys slip into the picture like on 'Laid Up', it comes at a moment of weakness where she is missing her old partner, and by the time we get to 'Belong, Vol 2', there is a security in finding a new love that means so much more. Now all of that being said, this is a dramatic arc in R&B we've seen done before, and if I were to highlight where Asiahn could have expanded the scope of this album, it would come in both detail and structure here, especially given that the songs with more detail like 'Drip', 'Lost In London', 'Like You', or even the betrayal that spurns 'Something New' are easy highlights of the project. But more to the point, there are songs that can't help but feel like fragments: I get 'Belong' serving as more of a intro for the longer composition to bookend the album, but 'Laid Up' can't help but feel abortive and the closing track 'Stuck' is barely a coda - a proper conclusion could have really driven this album home more effectively. But I'll be honest, to some extent that is nitpicking - I think if we want to talk about a real problem, we need to discuss the production, entirely handled by Cardiak. And I want to choose my words carefully here, because I don't think he's a bad producer by any stretch and resources might have been limited - but I'm not sure Asiahn is always flattered as much as she should be by some of the choices here. While I appreciate Cardiak understands her voice is this album's greatest asset by a mile, I'm not at all a fan of the oily layers he tacks onto it with songs like 'Drip' and 'NOLA' and 'Curiosity', where the trap percussion can sound thinner and cheaper than it should, especially against that guitar backdrop. But for as much as this album has a good command of its atmosphere, I do think the melodic backdrop could be a bit more developed in order to support the vocals - I dig the textured percussion on 'Something New', but imagine how much more distinctive if there was more actual tone other than a faded, warping melodic haze. Same with 'Games' and to a lesser extent 'Lost In London' and their firmer trap knock - hell, I'm not wild about the majority of the trap beats chosen for this project, especially when you get the more subtle, g-funk inflected melodies and fizzy percussion such as 'Like You' and 'Drip' or chimes-accented warbles of 'Truth, Vol. 2' and 'NOLA'. The only reason 'Lost In London' skirts that criticism is because it's got that roiling bassy rumble - similar case for 'Curiosity' with its ticking clock as a note-perfect metaphor for the time limit Asiahn knows is on the hookup who is exploring her sexuality. What I'm saying is that the production has some great subtle touches and absolutely compliments the atmosphere, but could afford a bit more colour and flair to help this stand out. But look, this is the sort of R&B that you can overthink or overanalyze when you don't need to, and indeed, this is a pretty damn solid album to follow off the EP two years ago, and could easily make a serious play for the mainstream if the right songs were positioned. And I'll freely admit this is an album on the absolute cusp of greatness - the writing is solid, the delivery is beautiful, and I do like a fair amount of the production and atmosphere as well - if you're looking for the progressive vibes, Asiahn definitely delivers. And thus for me... it's close, but I think I'm going to give this a extremely strong 7/10 and definitely a recommendation, but adding that I think if Asiahn continues on this path she's got a very bright future ahead of her. Again, this is an album that places her in a bigger conversation, and I'd love to see where she goes next, so check this out.